Many people think that tuition fees are the biggest hurdle for students who want to attend university. But they also face another, less obvious barrier: getting admitted to a higher education programme in the first place. Some countries use test scores or interviews to limit the number of students entering tertiary programmes; others have opted for an “open access” approach, whereby all students have the opportunity to attend university regardless of their previous schooling, grades, or skills. At first glance, the open access approach may seem most conducive to promoting equity in higher education – but that’s not always the case. This month’s Education Indicators in Focus brief takes a closer look at how the various entry requirements of university admission systems impact enrolment. As the figure below makes clear, countries with the highest share of rejected applicants are also those with highly selective admission systems. Less than 10% of applicants are rejected in Australia and France, for example, compared to more than 60% in Finland and Sweden. Interestingly, many of the countries with the most selective tertiary admission systems are also those with equitable and high-performing schools. According to the most recent PISA assessment, socio-economic status explains less than 10% of the variation in science performance in Finland, compared to more than 20% in France. 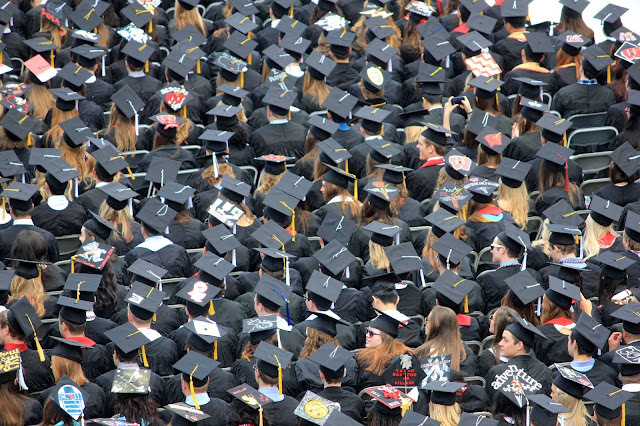 By giving all students an opportunity (or second chance) to succeed, open access to tertiary education can be seen as a way to reduce the impact of socio-economic disparities on school performance. But this is often wishful thinking. Even with open access admission systems, only 40% of tertiary students in France, and 30% in Australia, graduate within the regular duration of their programme – a sign that not all students have the skills necessary to progress in their studies. But low skills are not the only culprit; students also struggle to complete tertiary education in countries with high-quality and equitable education. 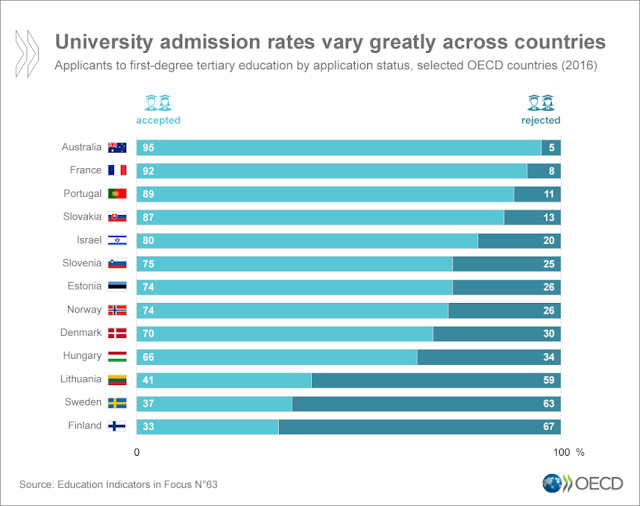 Students in Finland for example, are as likely to complete their degree as those in France, even though their admission systems are extremely different. The expansion of tertiary education, combined with a lack of guidance for students in upper secondary school, have left an entire generation trying to figure out how to match their competencies with labour market demands. This is where education systems and admission mechanisms can play an important role. They must support students in identifying the best way to leverage their skills, develop professionally and fully contribute to society – and that is no easy feat. It requires a deep understanding of labour market dynamics, the demand for skills, and the systems in place to develop them. But as access to tertiary education has expanded, channelling students to the right path has become a priority. Equitable access to higher education is not a question of open access versus selective admission systems. Without providing proper guidance for students, both systems will suffer from the same pitfalls.